Langila (New Britain, Papua New Guinea): (23 Dec) Volcanic Ash Advisory Center Darwin (VAAC) issued the following report: VA OBS TO FL080 EXT 25NM TO SE AT 23/2200Z. Dukono (Halmahera): Volcanic Ash Advisory Center Darwin (VAAC) issued the following report: VA OBS TO FL070 EXT 75NM TO ENE AT 24/0500Z. Volcanic Ash Advisory Center Darwin (VAAC) issued the following report: VA OBS TO FL070 EXT 80NM TO ENE AT 23/2330Z. 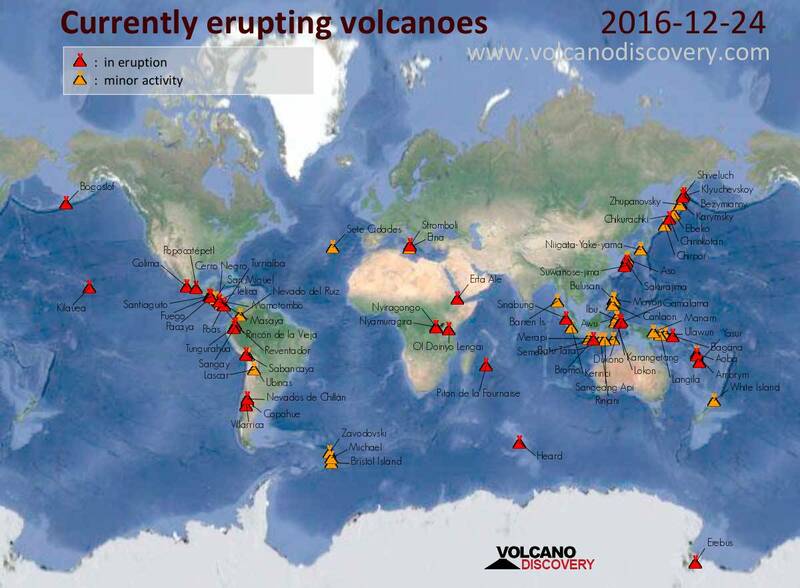 Bogoslof (United States, Aleutian Islands): (23 Dec) Another explosive eruption occurred at the volcano a few hours ago (at around 09:30 AKST local time), the Alaska Volcano Observatory reported. The alert level of Bogoslof was raised back to red.